We have in our anxious reviewer hands the current top-dog of the Asus 7-inch crowd, the Memo Pad 7 ME572C. The Asus naming convention doesn't help much in identifying specific models and one must resort to alphanumeric internal designations to differentiate it from the more humble Memo Pad 7 ME176C. The "C" in the end designates the Wi-Fi only version of the tablet, which we'll be reviewing, as opposed to the "CL" LTE-enabled model. Other than the cellular connectivity, however, both models are identical and our findings are equally true. 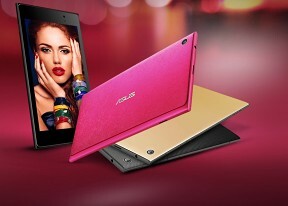 Asus boasts an extensive lineup of affordable tablets with multiple offerings spanning the entire range from 7" to 10". No less than five distinct 7-inchers are in existence, launched since 2014, and then we have a few more from earlier before, notably the Asus-made Google Nexus 7 (2013). Either way, the tablet in question has a lot going for it. As you can see the Memo Pad 7 ticks all of the right boxes, and our complaints are more nitpicking than actual design blunders. The sharp display is the best in the company's lineup at this size and is easily into Retina-grade pixel density territory. Intel's upper midrange chipset should be comparable to the popular flagship-grade Snapdragon 800. GPU is the same as in the iPhone 5S, but here it's clocked higher and should be able to beat the Adreno 330 bundled with the Snapdragon 800. 2GB or RAM allow for unhindered multitasking, while the expandable storage means plenty of room for content. Design is a throwback to the Nexus 7 with the same camera and button placement and overall footprint, albeit with sharp corners this time around. That's not to say that the Memo Pad 7 doesn't possess its own personality. Those are just first impressions, though. Follow us as we delve deeper into our review routine, starting with a closer look at the body and design. Will it receive Marshmallow OTA? Discontinued too soon. :( I love this tablet, it's actually the first one I ever bought. I hope that Asus makes another one just like it.